Abstract: VIA's second attempt at a 333MHz FSB AthlonXP chipset, known as the KT400A, is a good one even though it is a little too late to make a difference. 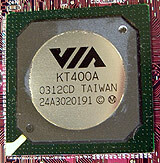 VIA's second attempt at a 333MHz FSB AthlonXP chipset, known as the KT400A, is a good one even though it is a little too late to make a difference. If the KT400A chipset had been released when the KT400 came out last year, the AMD chipset market would certainly look quite different than it does right now under the auspices of nVidia's nForce2. Of course, VIA's KT400A chipset wasn't released at the best of time, and now it seems as though it has firmly secured its position as the black sheep of the AMD chipset family. On top of that, with the recent announcement of the VIA KT600 chipset it certainly looks as though VIA have set the KT400A up to fail. The only positive aspect out of all of this is that VIA's KT400A chipset commands a very economical price tag. And so, today we're going to be testing the bright purple Magic Pro MP-K7V-400A mainboard which should appeal to budget minded consumers. Have Magic Pro, a name synonymous with inexpensive computer components been able to present a KT400A based motherboard attractive to the end user? Let's find out! With a retail price of just $118 CDN ($85 US), the MP-K7V-400A is quite inexpensively priced, but of course the motherboard is also quite bare of features. In terms of goodies, the board includes an onboard 5.1 soundcard and 10/100 LAN. In terms of expansion there are five PCI slots as well as a lone 8x AGP port. The board supports 200/266/333 MHz FSB based AthlonXP processors and the three DIMM slots can be occupied with up to 4GB of PC1600/2100/2700/3200 DDR memory. Please note, the MP-K7V-400A does not support the new 400 MHz based AthlonXP processors.... despite a name which could suggest that to some individuals. 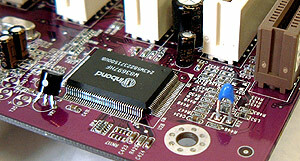 The "400" in KV7-400A in fact refers to 400MHz DDR memory. It was quite refreshing to work with the relatively small MP-K7V-400A. You're not going to have problems installing this motherboard into even those small cramped mid tower cases. 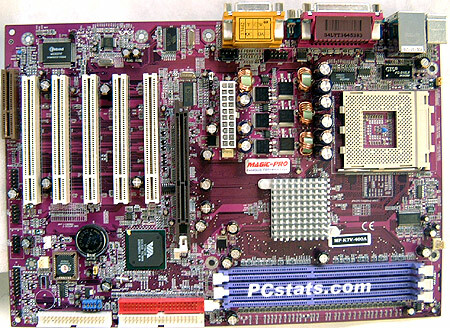 Since Magic-Pro does not actually produce their own motherboards I'm not sure who manufactured this particular board, though it does look a lot like a Soltek model. The layout of the MP-K7V-400A is not the greatest but one should not be surprised since the motherboard is only 21 CM wide. 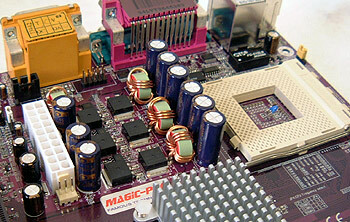 Magic-Pro does a good job at placing the USB, IrDA and front panel headers at the bottom of the motherboard. This way they won't interfere with the other system devices. The brackets which attach to these headers were not included however. The motherboard is pretty well labelled so if you're a DIY you should be just fine in the long run. While nForce2 chipsets require active cooling, the VIA KT400A does not generate a lot of heat so passive cooling suits it well. Those of you who are sensitive to noise will appreciate that. If you're using a longer videocard like a GeForce4 Ti4600, you'll have to remove the videocard if you make any changes to the IDE connectors. The floppy drive port is a bit low on the motherboard, we would have liked to see it a bit higher. I don't know why Magic-Pro decided to place multiplier jumpers on the motherboard when they're available for manipulation in the BIOS.